If Narc doesn’t qualify as a classic in your book, it damn well should. 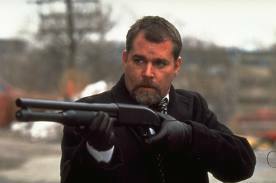 Released in 2002 and written and directed by Joe Carnahan, Narc has the atmosphere and tone of a '70s cop picture. Ray Liotta is at his balls out best as Lt. Henry Oak (it’s his greatest performance this side of Goodfellas and Cop Land) and Jason Patric, such an underappreciated noir actor, is tortured undercover narc Nick Tellis. Set in Detroit (but shot mostly in Toronto, with only one day of exterior shooting in the Motor City), Carnahan coaxes a trembling weariness out of his actors and his script. Everyone and everything is on edge, waiting for the world to cave in. In the opening sequence, Tellis, having just been being made as a cop, is chasing a drug dealer through the streets. On a playground, the dealer takes a child hostage. Tellis manages to shoot and kill the dealer, but he also accidentally shoots the child’s pregnant mother. It’s a frenzied scene shot with a handheld camera, horrifying and washed out and real, and we’re driven to despair for Tellis, who needed to act quickly or not act at all. Eighteen months later, we discover that the woman lost the baby and that Tellis was suspended. Though he’s haunted by the shooting, he’s fallen into a routine with his family and wants nothing to do with being a cop. But DPD wants him back. Another undercover narc, Michael Calvess, has been murdered and the investigation's dead-ended. The brass is convinced that Tellis still has the connections to find out what really went down. Tellis is against it. His wife wants him far away from the force. They’ve got a baby now. Their life together is getting back on track. Slowly, we realize the extent of Tellis’s involvement as a narc: in the name of infiltrating Detroit’s drug trade, he became a junkie while he worked the streets, and it took a long dose of detox for him to clean up. But Tellis soon understands he isn’t made for anything but cop work. He begins to read the case files and then agrees to investigate if the captain (Chi McBride) can secure him a desk job when it's over and if he’s teamed with Lt. Henry Oak, Calvess’s former partner. Oak is presented as violent and unstable, though he’s an effective investigator and the only person who has contributed anything valuable to the Calvess investigation. Ray Liotta’s Henry Oak is at the top of the list of reasons to watch this picture, if you haven’t. As always, he’s magnetic. That sharp stare. Those blood-weary expressions. A violent uneasiness behind everything he does. We’re never quite sure where we stand with Oak once he enters the narrative. Is a hero? A villain? Somehow he manages to seem like both of these things and neither. What he is above all, in Liotta’s capable hands, is Narc’s beating heart. As he and Tellis begin to investigate the few leads they have to grasp onto, they bond. Oak tells Tellis about a drug bust he made as a young cop. At the scene, he found a naked ten-year-old girl. She was being pimped out by her stepfather for money. Oak beat the guy half-to-death. He confesses that he thinks the Calvess case will fall through the cracks, that he wants better for his former partner and friend. Tellis sees Oak as hard-boiled and driven—his wife dead of cancer, a cop with a code and nothing to lose. We come to understand that Oak loved Calvess and his family, but that there’s more to the story than he's willing to let on. When Tellis visits Calvess’s widow, Oak tells him he’s crossed a line. The investigation finally begins to turn up leads, and the picture kicks into high gear. Oak and Tellis find Calvess’s badge at a suspect’s apartment. They kill the suspect in a shoot-out, and the brass is content to pin Calvess’s murder on him. But Oak and Tellis aren’t convinced. They continue to investigate. They uncover two main suspects, street guys who Calvess had dealings with, and Oak learns that they’re hiding out in an auto body shop. He and Tellis track them there. I won’t say anything else, except that the long scene that follows pays off the various mysteries that have been set up without telling us more than we need to know. It’s a tense, beautifully shot sequence—with Liotta and Patric at their sweaty best—and, still, we’re not sure whose side we’re on, or even if we’re on anyone’s side. 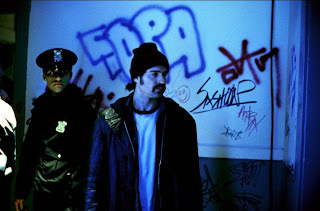 In his review of Narc, Roger Ebert says that Jason Patric, more than ten years removed from Rush, looks less like an actor playing a cop here and more like an actual cop. That’s a high compliment. Tellis has to make hard decisions throughout—shoot the dealer on the playground, give up on his family, trust Oak—and he most often makes the wrong one. Patric plays it all with a pained neutrality. We know there’s more to Tellis—we see so much in the dreamy, lingering shots of him holding his baby early on—but we also understand how deeply he identifies with Calvess. Narc, like the great crime pictures of the '70s, casts moralizing aside. It’s punchy and gritty, mysterious without being vague, violent and washed out, a hard portrait of the anguished lives of these Detroit narcotics officers. Mostly, though, it's a lesson in how to create and sustain tension. Every scene, every shot, feels heavy with significance. Every line, especially when it's Liotta or Patric speaking, gives us a sense of all that's boiling under the surface. Bill Boyle lives in Oxford, MS. His writing has appeared in Out of the Gutter, Chiron Review, Vol. 1 Brooklyn, Plots With Guns, Thuglit, Grift, Aethlon, Battling Boxing Stories, and other magazines and journals. He writes about '70s crime films at Goodbye Like A Bullet.